Atmospheric chemists measuring ozone depletion above the Arctic have found that 2011’s hole is the largest ever, due to an unusually long cold spell. When we think of the hole in the ozone layer, we usually think of the Antarctic, but the latest data suggests that the Arctic could be experiencing a severe depletion in the ultraviolet-blocking chemical too — at 20km above the ground, 80 percent of ozone is gone over an area five times the size of Germany. It was reported earlier in 2011 that the hole was expected to be large this year, but a recent paper in Nature is the first to fully analyze the extent of the phenomenon. The blame has been pinned on cold temperatures. The level of ozone in the atmosphere varies depending on temperature, as the chlorine compounds that break the ozone down are most active at lower temperatures. This year didn’t break any low-temperature records in the Arctic, but the upper-air region where the ozone sits stayed chilly for an unusually long time over an unusually large area. On the bright side, the root cause of this problem — anthropogenic CFC emissions — were successfully restricted in 1987 by the Montreal Protocol, and eventually eliminated in a rare case of international co-operation over atmospheric science. 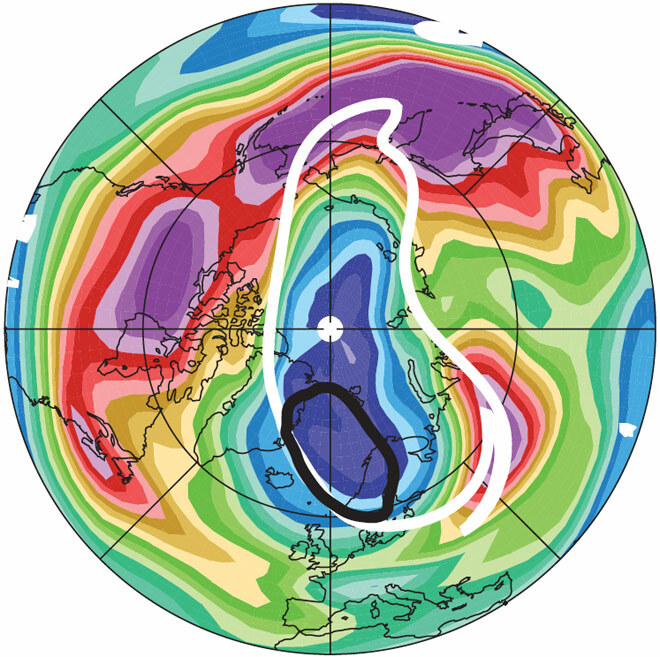 It’s just that the chlorine compounds that were emitted prior to the restrictions being implemented can persist for a long time in the upper atmosphere. The ozone layer is on its way back to health, and isn’t expected to get any better before the middle of the century, but at least it isn’t getting much sicker.